Hi Tod. We normally don't do a build thread, but here is our plan for the $2017 Challenge. Wish us luck. We are starting with a $1,000 Mustang SVO and a $250 Merkur XR$Ti parts car. The good news is that the previous owner delivered it to Tod's place, as in drove it over. Among the bad news is that it would start to build boost, then fall off to nothing. Right now the plan for $2017 is a re-paint, a little chassis stiffening, simply running as it should, and hopefully some fat tires. I don't see us having much time for testing before The Challenge, so no need for other competitors to worry about us (this year). Definitely sounds like more than a few months work to get ready, but next year?? I assume you have Team shirts already. Cool! So now we know what your turbo Lima project is. Not sure what your longer term plans are for the XR, but let me know if you're ever letting it go. OK, so I'm not good(talented) at posting photos. 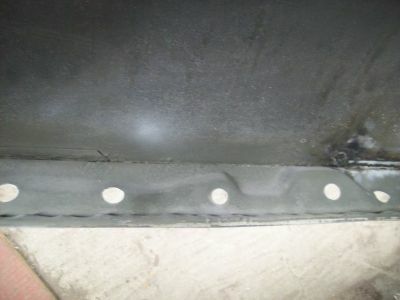 Here I've ground off one of the 6 patches I welded onto the SVO hood. I like to use an air grinder because it's slower, making it harder to screw up. This in the next patch over before grinding. I'm assuming a rust free SVO hood cost more than the entire Challenge budget, so I weld. It might be hard to see here but the car already has 3 paint jobs (factory plus 2 re-paints). I'll be adding the 4th. Yikes! A little background on us. 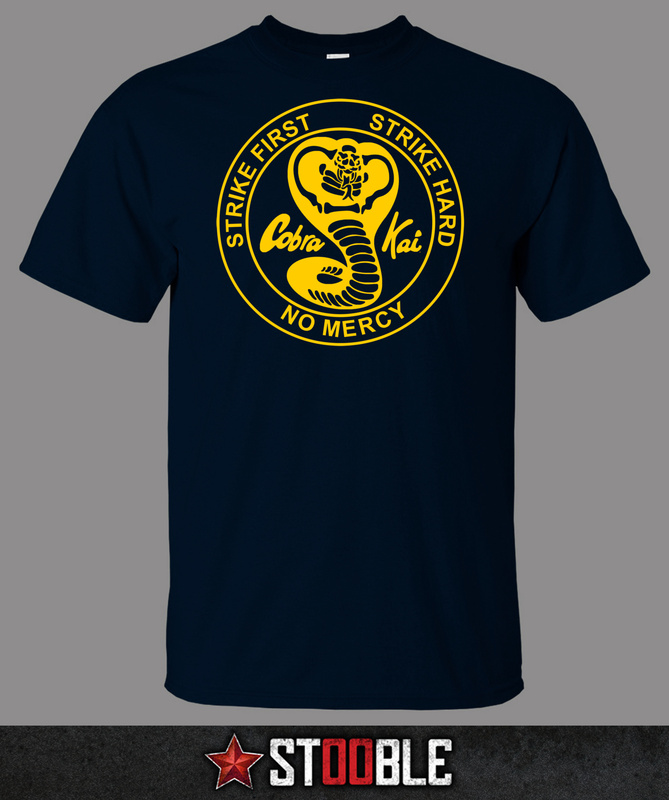 Our team name is Cobra Kai Speed Shoppe, but that's kind of a joke. We do most of our Challenge car building under a car port. The stripe on our (award winning) $2016 Miata was painted outside. And Cobra Kai was the dojo of that bad guys in the "Karate Kid" movie. See the shirt above. (Thank you 914driver.) We ran a year as Hello Kitty racing, and we felt it was not very menacing. We have won a handful of awards at The Challenge, for which we are very grateful. If you have sat through a few Challenge banquets without winning anything, when a win finally comes it's huge. I've restored a '27 Model T coupe, and a '67 Fairlane 500 hardtop. I still have the Fairlane. 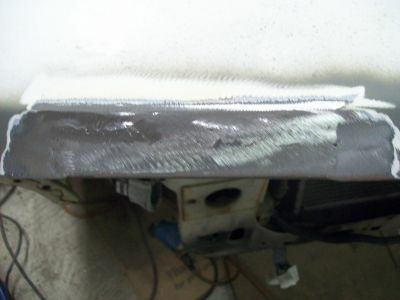 I've also done panel repair on cars like a classic Mustangs. 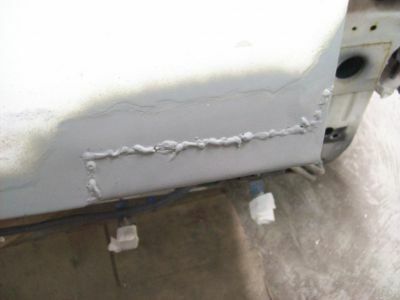 I took 3 semesters at a local vocational high school for body repair. Back then the course cost just about $1 per hour. We have previously painted 3 of our Challenge cars: a Fiero, a '96 Mustang with a huge horse painted on each side, and a TR7 with a 4.2 litre Rover V-8 swap. The TR7 below took 2nd place at Concourse behind a spotless turbo Dodge. I just noticed that this photo gives you a nice look at the rims. We cut up 8 steel rims and welded them together to go from a stock 5.5" rim to nearly 7". That let us run a 215 wide tire. 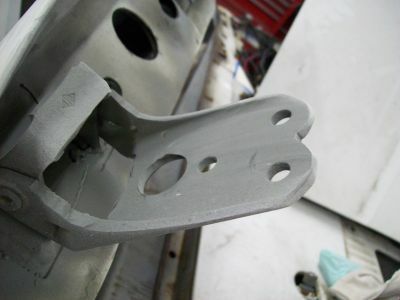 I have some new bendix fox body front pads that'll fit in a small flat rate priority mail box if you need them. Mistakenly ordered in a time of desperation for the datsun as i didn't realize it actually had fox body rear discs on the back and not fronts. Great to see. I can always count on great stuff from Cobra Kai. In the very first $1500 Challenge didn't Tim Suddard win with a SVO Mustang? You might have some sentimental influence on him as a judge or he might have intimate knowledge of the SVO and expectations. I'm in to follow the progress. Good luck guys! 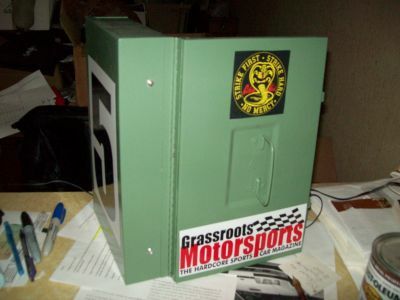 If you have an extra sandwich style oil/water cooler, I am willing to help with your budget. Hi Pat, Yes, we sat with you and John. (It was awesome when John won the spirit of the event award. He really deserved it.) I remember your adorable daughter and her tiny cast. I'm guessing the SVO has odd sized brake pads, but thanks for the offer. I noticed right away that the rears were easily twice the size of the ones on our '94. John, I spoke to Pro driver Danny Shields and I think he said he drove Tim's SVO to a first place finish in the autocross portion. This car in the fine tuned form should be 150 pounds lighter than our '94 Mustang that took a 3rd place autocross trophy. 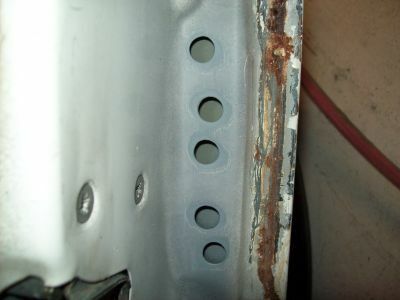 After Rolling all the fenders I bolted on some 315 tires too see how they fit, but the math says a 295 could be smarter. But like I mentioned, I don't expect to be a threat this year because of the lack of time for testing, etc. Psst, John. I've given up on trying to figure out the judging. We just build what we like, and maybe the judges will like it too. 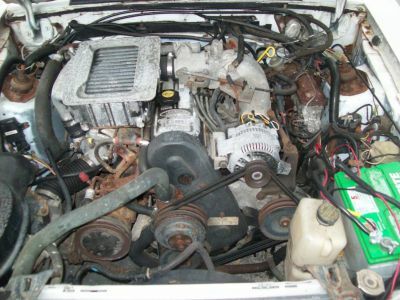 Though motor swaps and themes do usually earn points. When we won the Mazda award in $2016 Tod and I were so shocked we took a couple of minutes to stand up. Dean Case asked if we were even in the room. The oil cooler is sandwiched between the block and oil filter, it has two water lines running to it that also likely go to the heater. It warms the oil faster and then keeps it cool with the water. There should be one on each of your cars. Working on the rusty doors has been one of the biggest projects. Trust me, if it's not a Challenge car just replace that rusty door. Since I'm lightening the doors I don't need a big heavy hinge anymore, so I got out the grinder and hole saw. A lot of this hinge is now missing. Gutting the doors means we need a window net. I just put the rods inside the net and that told me where the mounts needed to be welded on. I did break a drill bit making the hole for one of the pins and getting out the broken drill was a PITA. I needed a cover after removing the side mirror so I made a paper template and cut this out of a piece of scrap. I did the 90 degree outer bend on my bender, but the second bend would only go about 45 degrees. I bent the remainder by hand making the opening a little small so it would hug the door. 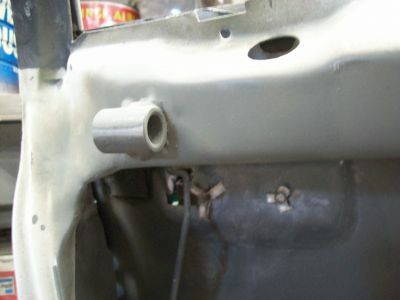 A sheet metal screw on the inside holds it in place. Cutting out the inner door leaves a sharp edge. This time I decided to fold it over to leave it smooth. I used channel lock pliers to do most of the bend, then a body hammer to finish off the fold. When I was repairing the rust holes in the bottom of the door I found out that the entire bottom half of the door was covered in Bondo. 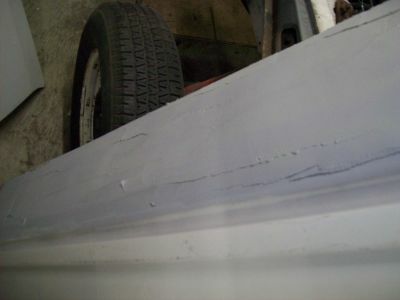 I thought I had better check under the bondo for rust, and yes it was there. Since the bottom of the door was already so bad I just put in new bondo. 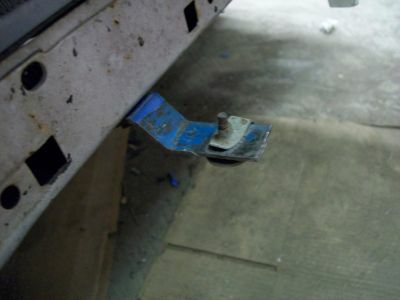 (See photo) The door actually needed a lower outer skin, but Challenge Car, so "no". 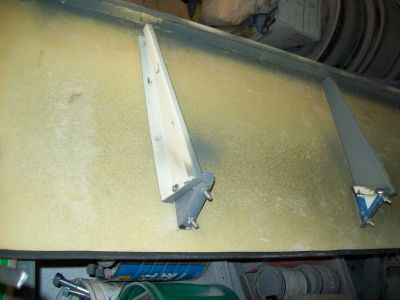 This is the cowl vent cover. It had been painted several times, and was cracked and warped. I glued it back together, scuffed the paint, and hit it with a coat of Bumper black (since it's flexible paint). The bumper black showed every flaw, so it hit it again with some flat black... success. Well, you have to stand 5 feet away from it without your glasses, but it looks o.k. again. 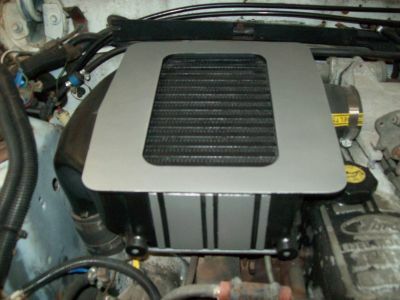 We are likely to sell the inter-cooler at some point to replace it with a front mount unit, so spending the time should eventually help our sell off numbers. 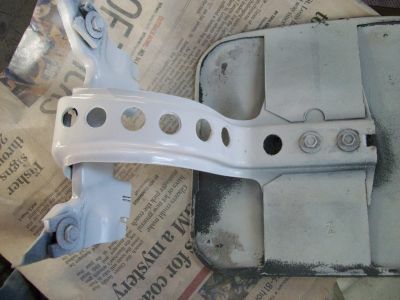 You'll note that both mounting brackets are missing, and it appears to be connected with heater hose. That's the way it came an it's surprisingly solid. 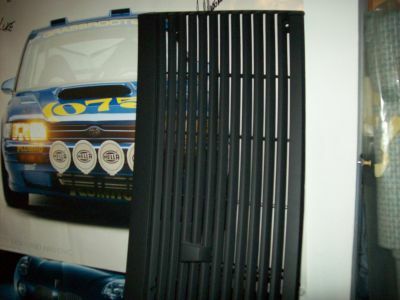 I do have a Turbo Coupe inter-cooler I got at the Moultrie swap meet for $25, but the larger heavier part would certainly need brackets to support it. This is the hideously dirty engine compartment. This is going to kill us at Judging. The finished form of the motor will likely be a mix and match of high mileage Merkur and low mileage SVO, but that won't happen for $2017. So there's no way I'm yanking this version to paint the engine compartment and clean up the motor. I have moved the battery to the back, and changed the air filter to a cone filter (another Moultrie purchase) with a box around it. I assume other Challenge competitors have sleepless nights trying to make similar decisions, but I eventually decided to run one sway bar. Though the mount is set up so I can add a second bar in the future if desired. 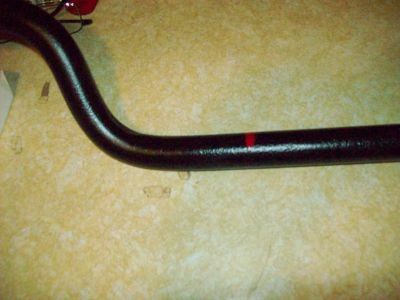 It turns out the SVO bar is one of the fattest factory bars made for the Fox platform. It's noticeably larger than the bar on our '94 V-8 car. The SVO nose is reportedly 150 pounds lighter so the one fatter factory bar may work. I'll add that I was not thrilled with the look of the end link spacing tubes, so I added a few tack welds. The SVO end links are more narrow than the V-8 links which leaves me having to trust the Ford engineers that they will be strong enough. Is that window net attached to the door? 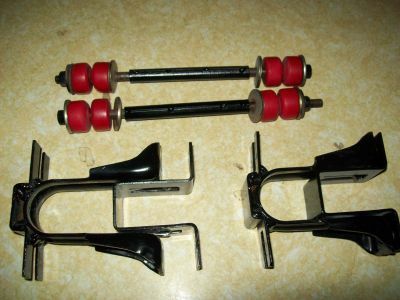 Most series mandate it attaches to the car body or cage. Not sure if it matters for the challenge. Yes, the window net is attached to the door, since we are not running a cage. It has not been a problem in the past, but I have heard that tech inspection is going to be harder this year. Here is part of the reason I think we may have been best off financially by parting out this car. 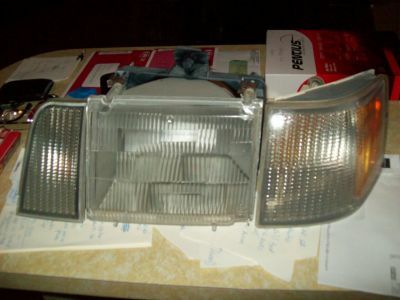 I saw a guy on an internet auction site asking $1,000 for the set of 6 front headlights. (The '86 has a unique one.) We paid $1,000 for the entire car! Anyway they were very foggy, so here is one side after using a Turtle Wax headlight cleaner kit. It's probably the cheapest kit at around $8, but it seems to work fine. I realized that I'm likely to make a lot of references to our old Mustang, so I thought I'd post a photo. 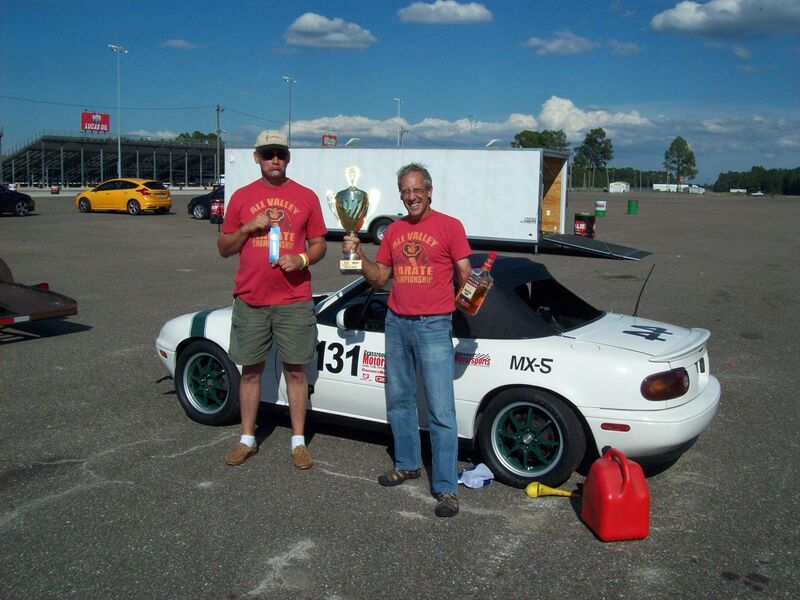 It took a 3rd place autocross trophy at the $2015 Challenge .... because Mustangs are excellent autocross cars? This is Tod and I at the $2016 Challenge. Tod is holding his General Tire Challenge trophy (and some borrowed booze), I'm holding the Participant Award John W. gave us. Thank you John. The '94 R-code Miata won the Mazda Choice award. Our shirts say, Cobra Kai, All Valley Karate Championship. 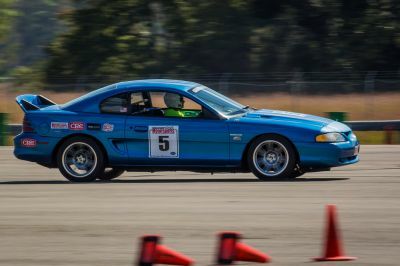 Our '94 GT with Pro-Driver, Danny Shields, at the wheel. We jokingly say, "It's fast.... for a Mustang", because we've heard it so often. That blue Mustang makes cool sounds! Lof8 wrote: That blue Mustang makes cool sounds! Mustang noise Video from the GRM Facebook page. People assume it's a really mean motor, but it's bone stock with headers, a H-pipe, and turn down tips. Forgive my posting clumsiness, I'm new at this. I saw Tommy use a step drill in a GRM video and decided to get one at the last Daytona flea market. The seller mentioned in passing about being able to hit the opposite side to clean off the hole. I'm really glad he said that. Anyway I'm in love with the step drill for making holes, especially where I have access to both sides. 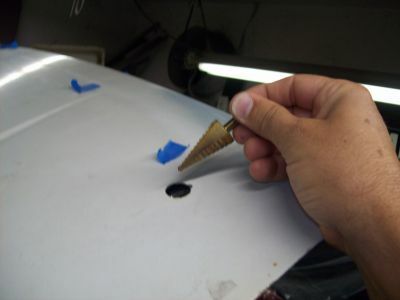 It's quick, clean, and makes a much rounder hole than a drill. 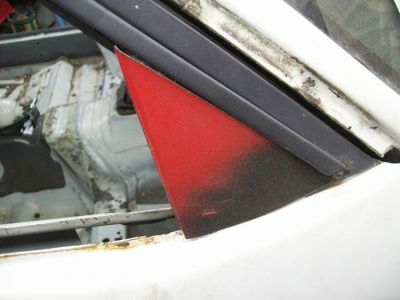 Gas filler door holes for style. It's probably only an ounce lighter. I keep reminding myself that knowing how much gas(weight) is in the tank is likely far more important. This is our one luxury, because we love it too much to sell it. 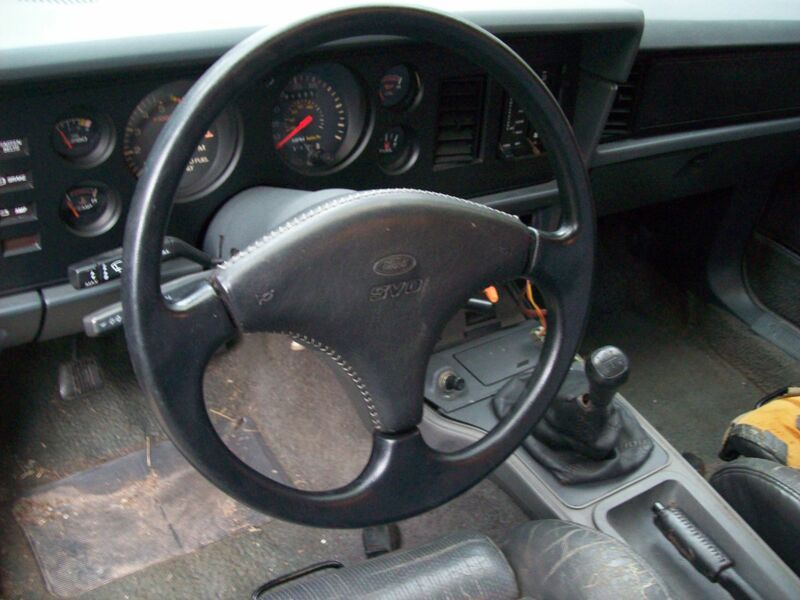 The unique SVO steering wheel center. I've cleaned it up since this photo, and the leather looks awesome. They sell for pretty good money, so it could really help with the "sell off" part of our budget. But it's so darn pretty. The keen eye will notice the SVO has a boost gauge. This is our very first turbo Challenge car. I like to say that I learn something new on every Challenge build. This time it will likely be turbo related.